(Photo: Ecumenical News / Peter Kenny)Lutheran World Federation President Bishop Munib Younan to the main governing body of the LWF, its Council at the Ecumenical Center, Geneva on June 18, 2015. The world is filled with apocalyptic movements and Lutherans need to assist Christian communities living alongside dangerous forms of Islamist ideology says the Palestinian bishop who is president of the Lutheran World Federation. "We receive daily reports about a group calling itself Islamic State seeking to create spheres of dogmatic purity by inflicting human suffering on vulnerable communities," said Bishop Munib Younan. The LWF president who leads his church in the Holy Land said the issues facing Christians there is not just a local one. "I believe it is essential for the Lutheran World Federation to take the lead, along with other international organizations, to call a conference of Christians living in Muslim- majority contexts," he said. Speaking the LWF's main governing body, its council, Younan also said on June 18, "We see the merchants of the Prosperity Gospel creating the illusion of wealth and happiness while consigning others to suffering and loss. The LWF is meeting June 18-22 June in Geneva. "We see the constant preaching of many evangelists telling us that the new chosen ones will be raptured away from worldly suffering, offering escapism instead of hope. "We see other preachers relying almost solely on the strength of empire, placing their hope in human power to achieve their interpretations of prophecy." Younan said that many Christians are eager for dialogue with all of their neighbors, but "there can be little dialogue with someone convinced that you should leave your land or be beheaded." 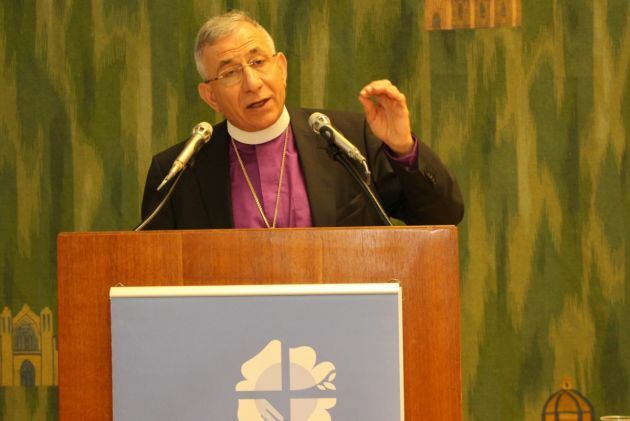 As bishop of the Evangelical Lutheran Church in Jordan and the Holy Land, Younan called on the worldwide Lutheran communion to engage in "robust moderation" to counter growing extremism. "The challenge of Christians today is to offer a strong defense of religious and political moderation, to respectfully offer a reason for the hope that is within us, even as we confront the worldly nihilism religiously-sanctioned extremism," said the LWF president. He noted that if Lutherans did not address these issues facing Christianity, the threats will grow due to extremist groups being present in many other contexts. "Pope Francis has warned of 'a kind of third world war being fought piecemeal.' These groups will engage in more direct attacks within Europe and North America as their resources and capabilities grow. "It is time for Western Christians to listen to and learn from Christian sisters and brothers who have long been living with these challenges."